The Interest Group on Migration and Refugee Law of the European Society of International Law, the Centre for Migration Law of the Radboud University Nijmegen and the Amsterdam Center for International Law of the University of Amsterdam are pleased to announce ‘Heading to Europe: Safe Haven or Graveyard?’, a panel discussion on migration by sea in the Mediterranean. The panel discussion will be held on 16 May 2014 at the Radboud University Nijmegen. The year of 2013 has demonstrated that the tragedy of thousands of migrants and refugees drowning on the shores of Europe is now a common occurrence. The fate of those who perished near the Italian island of Lampedusa has brought the urgency of the situation into focus. The aim of the panel discussion is to provide an overview of the legal rules and processes applicable to migration by sea in the Mediterranean and to reflect on their wider sociological implications. The panel discussion consists of two panels, each followed by a plenary discussion. In the first panel, legal experts working in the field of academia and at stakeholder organizations (e.g. UN Refugee Agency, Council of Europe, European Union) focus on legal aspects of boat migration in the Mediterranean. The second panel brings together scholars and practitioners with first-hand experience from transit countries to discuss the sociological effects of the legal rules and processes. Click here for the complete program, and here for more information on the panelists. The organizing partners cordially invite interested scholars, governments officials, practitioners and advanced students to join in the panel discussion ‘Heading to Europe: Safe Haven or Graveyard?’. Active participation in the discussion is strongly encouraged. Participation is free of charge. For participation, please register at the bottom of this page. For inquiries, please contact Lisa-Marie Komp at lisa-marie.komp@law-school.de. Location is the CPO-zaal, Spinozagebouw at the Radboud University in Nijmegen (Montessorilaan 3). There is an intelligence gap on terrorist groups active in the EU and their connections with irregular-migration networks. The absence of strategic knowledge may constitute a vulnerability for internal security. 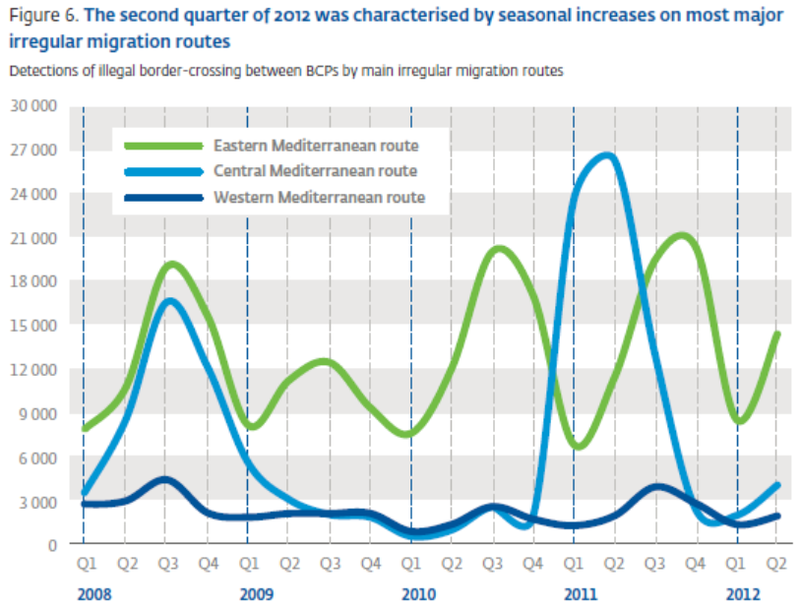 Irregular migration across the Western Mediterranean towards southern Spain was at a low level through most of 2010. 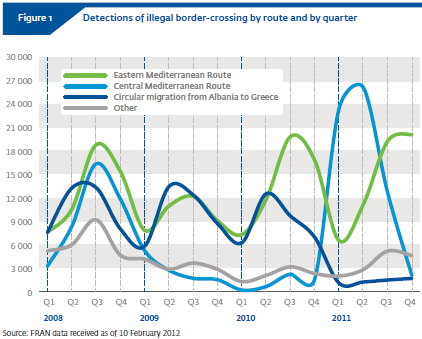 However, pressure has been steadily increasing throughout 2011 to reach almost 8 500 detections, or 6% of the EU total. A wide range of migrants from North African and sub-Saharan countries were increasingly detected in this region. It is difficult to analyse the exact composition of the flow, as the number of migrants of unknown nationality on this route doubled compared to the previous quarter. This may indicate an increasing proportion of nationalities that are of very similar ethnicity and/or geographic origin. The most common and increasingly detected were migrants of unknown nationality, followed by migrants local to the region, coming from Algeria and Morocco. There were also significant increases in migrants departing from further afield, namely countries such as Côte d’Ivoire, Guinea, Nigeria and Congo. In 2011, two boats were intercepted in the waters of the Balearic Islands with Algerians on board, having departed from the village of Dellys (Algeria) near Algiers. However, most migrants prefer to target the southern coast of the Iberian Peninsula. [***] According to information received from Member States, the top nationalities detected as victims of human trafficking in the EU still include Brazilians, Chinese, Nigerians, Ukrainians and Vietnamese. In addition, victims from other third countries like Albania, Ghana, Morocco, Moldova, Egypt, Indian, the Philippines and the Dominican Republic have also been reported, illustrating the broad geographical distribution of the places of origin of victims. Most THB cases are related to illegal work and sexual exploitation in Europe. In some cases, the distinction between the smuggling of migrants and THB is not easily established because some of the migrants are initially using the services of smugglers, but it is only later, once in the EU, that they may fall victim to THB. According to intelligence from JO Hermes, this is particularly the case for women embarking for illegal border-crossing from North Africa to the EU. Once in Europe, some of them are intimated by their smugglers and forced into prostitution. 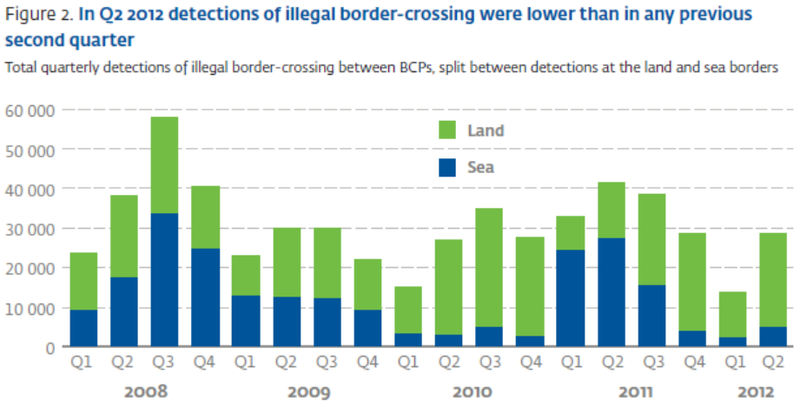 A worrying trend reported during JO Indalo is the increasing number of detections of illegal border-crossing by minors and pregnant women (see Fig. 15), as criminal groups are taking advantage of an immigration law preventing their return. Although it is not clear whether these cases are related to THB, women and children are among the most vulnerable. Most of these women claimed to be from Nigeria, Côte d’Ivoire and Cameroon and were between the fifth and ninth month of pregnancy. Minors were identified as being from Nigeria, Algeria and Congo. Depending on the political situation, migrants from the Middle East may increasingly join the flow. In addition, migrants from northern and western Africa, willing to illegally cross the EU external borders, are expected to increasingly take advantage of the Turkish visa policies, granting visas to a different set of nationalities than the EU, and the expansion of Turkish Airlines, to transit through the Turkish air borders to subsequently attempt to enter the EU illegally, either by air or through the neighbouring land or sea borders. As a result, border-control authorities will increasingly be confronted with a wider variety of nationalities, and probably also a greater diversity of facilitation networks, further complicating the tasks of law-enforcement authorities. The likelihood of large numbers of illegal border-crossing in the southern maritime border remains very high, either in the form of sporadic episodes similar to those reported in 2011 or in sustained flows on specific routes originating from Africa. Irregular-migration flows at the southern maritime borders are expected to be concentrated within one of the three known routes, i.e. the Central Mediterranean route, the Western Mediterranean route or the Western African route. Larger flows are more likely to develop on the Central Mediterranean route than on the other two routes, because of its proximity to Tunisia, Libya and Egypt, where political instability and high unemployment rate among young people is pushing people away from their countries and where there is evidence for well-organised facilitation networks. On the Western Mediterranean route, the situation remains of concern because of the increasing trend of illegal border-crossing reported throughout 2011. According to reported detections, the situation on the Western African route has been mostly under control since 2008 but remains critically dependant of the implementation of effective return agreements between Spain and western African countries. Should these agreements be jeopardised, irregular migration pushed by high unemployment and poverty is likely to resume quickly despite increased surveillance. The composition of the flow is dependent on the route and the countries of departure, but includes a large majority of western and North Africans. Mostly economically driven, irregular migration on these routes is also increasingly dependent on the humanitarian crisis in western and northern African countries. Facilitators are increasingly recruiting their candidates for illegal border-crossing from the group that are most vulnerable to THB, i.e. women and children, causing increasing challenges for border control authorities. At the horizon of 2013, the operational environments of border control are likely to be affected, on the one hand, by austerity measures reducing resources, and on the other hand, by increased passenger flows triggering more reliance on technological equipment. Austerity measures have been introduced throughout Member States in various forms since 2009. The most obvious examples are found in Greece, Ireland, Portugal, Spain and the Baltic countries. These measures could result in increasing disparities between Member States in their capacity to perform border controls and hence enabling facilitators to select border types and sections that are perceived as weaker in detecting specific modi operandi. Budget cuts could also exacerbate the problem of corruption, increasing the vulnerability to illegal activities across the external borders. 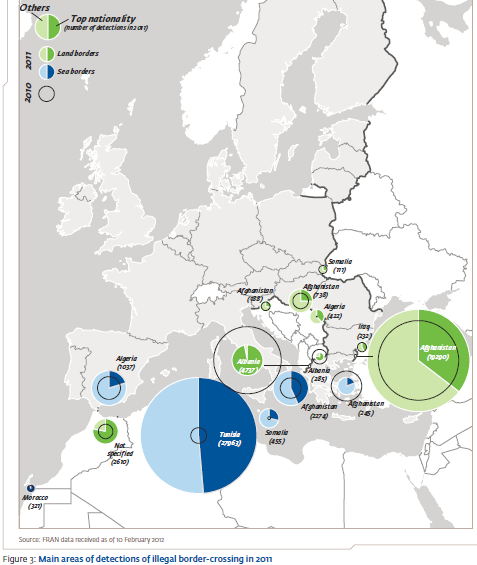 Click here or on this link: Frontex_Annual_Risk_Analysis_2012, for 2012 Frontex ARA. Click here for Frontex press statement on the 2012 ARA. Click here for my post on the 2011 ARA. ECJ Advocate General Paolo Mengozzi issued an Opinion on 17 April in which he recommended that the European Court of Justice annul Council Decision 2010/252/EU of 26 April 2010 supplementing the Schengen Borders Code as regards the surveillance of the sea external borders in the context of operational cooperation coordinated by Frontex (Sea Borders Rule). The Advocate General’s recommendation, issued in the case of the European Parliament v Council of the EU, Case C-355/10, will be considered by the ECJ in the coming weeks. The case was filed by the European Parliament on 12 July 2010. A hearing was conducted on 25 January 2012. The Advocate General’s recommendation is based primarily on the conclusion that the Council adopted the Frontex Sea Borders Rule by invoking a procedure which may only be used to amend “non-essential elements” of the Schengen Borders Code. The Advocate General concluded that rather than amending “non-essential elements” of the SBC, the Council Decision introduces “new essential elements” into the SBC and amends the Frontex Regulation. The recommendation calls for the effects of the Sea Borders Rule to be maintained until a new act can be adopted in accordance with ordinary legislative procedures. While this case presents a procedural question and does not involve a review of any of the substantive provisions of the Sea Borders Rule, the Advocate General’s statement in Paragraph 64 that “the applicability of the principle of non-refoulement in international waters” is a “controversial” position is wrong. Perhaps the position is still controversial in some circles, but legally, with the important exception expressed by the US Supreme Court, it is clear that non-refoulement obligations apply to actions taken in international waters. Click here for Opinion of Advocate General Mengozzi, Case C-355/10, 17 April 2012. Click here for my last post on the case. “1. In the present proceedings, the European Parliament requests the Court to annul Council Decision 2010/252/EU of 26 April 2010 supplementing the Schengen Borders Code (2) as regards the surveillance of the sea external borders in the context of operational cooperation coordinated by the European Agency for the Management of Operational Cooperation at the External Borders of the Member States of the European Union (‘the contested decision’). (3) If the action should be upheld, Parliament requests that the effects of the contested decision be maintained until it shall have been replaced. 11. Point 1 of Part I to the Annex lays down certain general principles intended, inter alia, to guarantee that maritime surveillance operations are conducted in accordance with fundamental rights and the principle of non-refoulement. Point 2 contains detailed provisions on interception and lists the measures that may be taken in the course of the surveillance operation ‘against ships or other sea craft with regard to which there are reasonable grounds for suspecting that they carry persons intending to circumvent the checks at border crossing points’ (point 2.4). The conditions for taking such measures vary depending on whether the interception takes place in the territorial waters and contiguous zone of a Member State (point 2.5.1) or on the high seas (point 2.5.2). Point 1 of Part II to the Annex lays down provisions on units participating in the surveillance operation in search and rescue situations, including with regard to communicating and forwarding information to the rescue coordination centre responsible for the area in question and the coordination centre of the operation, and defines certain conditions for the existence of an emergency (point 1.4). Point 2 lays down guidelines on the modalities for the disembarkation of the persons intercepted or rescued. 12. By act lodged at the Registry of the Court of Justice on 12 July 2010, the Parliament brought the action which forms the subject-matter of the present proceedings. The Commission intervened in support of the Council. At the hearing of 25 January 2012, the agents of the three institutions presented oral argument. 13. The Parliament claims that the Court should annul the contested decision, rule that the effects thereof be maintained until it is replaced, and order the Council to pay the costs. 14. The Council contends that the Court should dismiss the application as inadmissible or, in the alternative, as unfounded and order the Parliament to pay the costs. 15. The Commission requests the Court to dismiss the application and order the Parliament to pay the costs. 23. For all the reasons set out above, the application must, in my view, be declared admissible. 24. The Parliament considers that the contested decision exceeds the implementing powers conferred by Article 12(5) of the SBC and therefore falls outside the ambit of its legal basis. In that context it raises three complaints. Firstly, the contested decision introduces new essential elements into the SBC. Secondly, it alters essential elements of the SBC. Thirdly, it interferes with the system created by the Frontex Regulation. These complaints are examined separately below. 61. Given both the sphere of which the legislation in question forms part and the objectives and general scheme of the SBC, in which surveillance is a fundamental component of border control policy, and notwithstanding the latitude left to the Commission by Article 12(5), I consider that strong measures such as those listed in point 2.4 of the annex to the contested decision, in particular those in subparagraphs (b), (d), (f) and g), and the provisions on disembarkation contained in Part II to that annex, govern essential elements of external maritime border surveillance. These measures entail options likely to affect individuals’ personal freedoms and fundamental rights (for example, searches, apprehension, seizure of the vessel, etc. 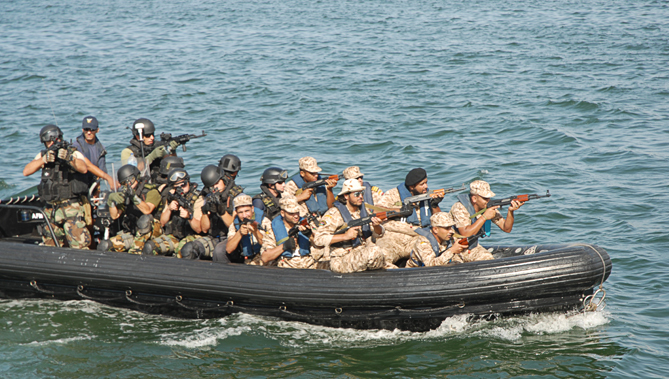 ), the opportunity those individuals have of relying on and obtaining in the Union the protection they may be entitled to enjoy under international law (this is true of the rules on disembarkation in the absence of precise indications on how the authorities are to take account of the individual situation of those on board the intercepted vessel), (47) and also the relations between the Union or the Member States participating in the surveillance operation and the third countries involved in that operation. 63. Two further observations militate in favour of the conclusions reached above. 66. In the light of all the preceding provisions, I consider that the contested decision governs essential elements of the basic legislation within the meaning of the case-law set out in points 26 to 29 of this Opinion. 67. Therefore, the Parliament’s first complaint must, in my opinion, be upheld. 69. The Parliament’s argument is based on the premise that Article 13 is applicable to border surveillance too. This interpretation is opposed by both the Council and the Commission, which consider that the obligation to adopt a measure for which reasons are stated pursuant to that provision exists only when a person who has duly presented himself at a border crossing point and been subject to the checks provided for in the SBC has been refused entry into the territory of Union. 70. The Parliament’s complaint must, in my view, be rejected, with no need to give a ruling, as to the substance, on the delicate question of the scope of Article 13 SBC on which the Court will, in all likelihood, be called to rule in the future. 84. Furthermore, the non-binding guidelines contained in Part II to the annex to the contested decision relating to search and rescue situations govern aspects of the operation that do not fall within Frontex’s duties. As the Commission itself points out in the proposal on the basis of which the contested decision was adopted, Frontex is not an SAR agency (65) and ‘the fact that most of the maritime operations coordinated by it turn into search and rescue operations removes them from the scope of Frontex’. (66) The same is true with regard to the rules on disembarkation. None the less, the contested decision provides for those guidelines to be incorporated into the operational plan. 85. On the basis of the foregoing considerations, I consider that, by regulating aspects relating to operational cooperation between Member States in the field of management of the Union’s external borders that fall within the scope of the Frontex Regulation and, in any event, by laying down rules that interfere with the functioning of the Agency established by that regulation, the contested decision exceeds the implementing powers conferred by Article 12(5) of the SBC. 89. In the light of the foregoing, the action must, in my view, be allowed and the contested decision annulled. 91. In the present case, annulment pure and simple of the contested decision would deprive the Union of an important legal instrument for coordinating joint action by the Member States in the field of managing surveillance of the Union’s maritime borders, and for making that surveillance more in keeping with human rights and the rules for the protection of refugees. 92. For the reasons set out, I consider that the Parliament’s application should be granted and the effects of the contested decision maintained until an act adopted in accordance with the ordinary legislative procedure shall have been adopted. Click here for previous post on topic. Italian officials report that 42,807 migrants landed in Italy during the first five months of 2011. The arrivals involved 507 separate landings. This number contrasts with 4,406 arrivals in all of 2010 involving 159 separate landings. Most of the migrants in 2011 have been Tunisian nationals (24,356) whereas Afghans (1699) were the largest group in 2010. Most migrants crossed the Adriatic in 2010 whereas the central Mediterranean is now the location of most migrant voyages. 2010: Afghanistan (1699), Tunisia (650), Egypt (551), Algeria (297), Iraq (161), Iran (159) , Palestine (128), Turkey (112), Syria (100), Somalia (61), Eritrea (55). January–May 2011: Tunisia (24,356), Somalia, Eritrea, Ethiopia (combined total of 4,157), Nigeria (1689), Ghana (1312), Mali (1134), Bangladesh (827), Egypt (761), Côte d’Ivoire (730), Afghanistan (713), Pakistan (530). 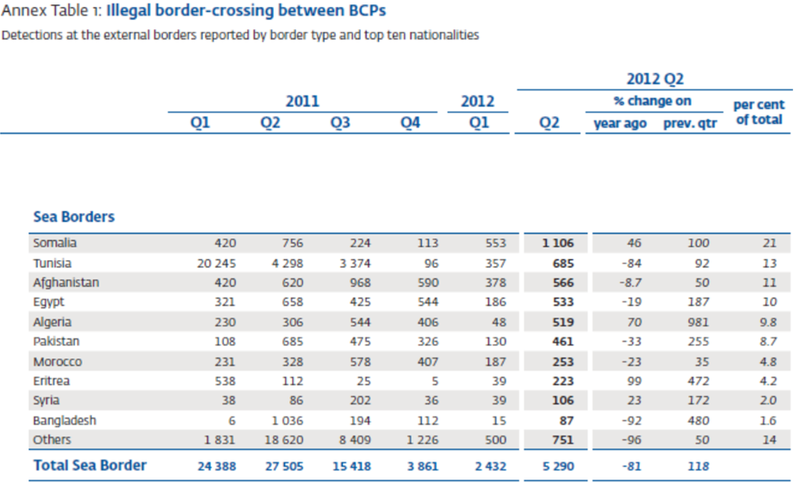 On 16 January the Frontex Risk Analysis Unit released its Report for the Third Quarter of 2010 (July-Sept.). The report contains data, charts, and graphs detailing detections of migrants, asylum seekers, false document use, detections of facilitators, and other information. 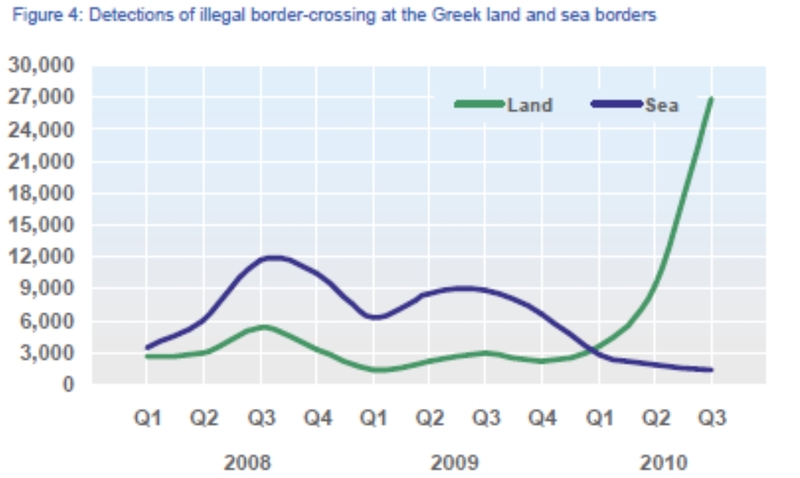 The deployment of Frontex’s RABIT force to the Greek-Turkey border did not begin until 2 November 2010, so the effects of the RABIT deployment do not appear in the Third Quarter. 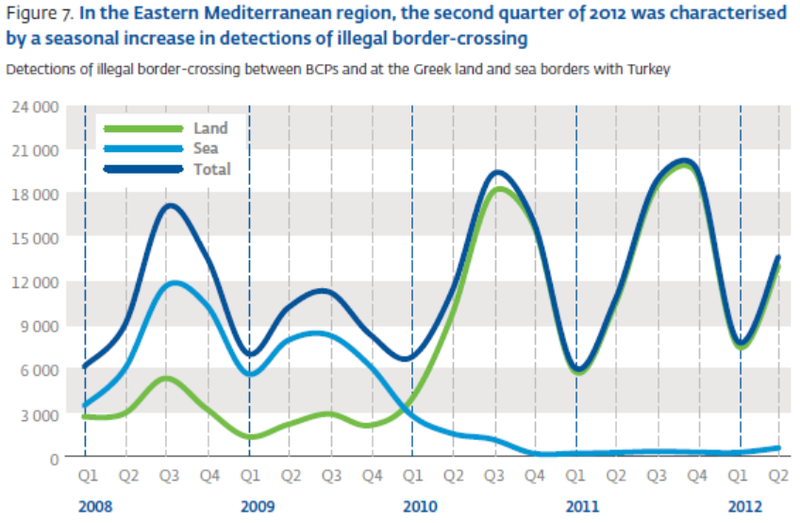 The Report also notes an increase in the number of detections on the Central and Western Mediterranean sea routes compared to Q2 which may be attributable to seasonal variations or “may be indicative of reorganized modi operandi in these areas in response to Frontex Joint Operations, more effective border controls and bilateral agreements implemented in 2008.” See Figure 3 below. 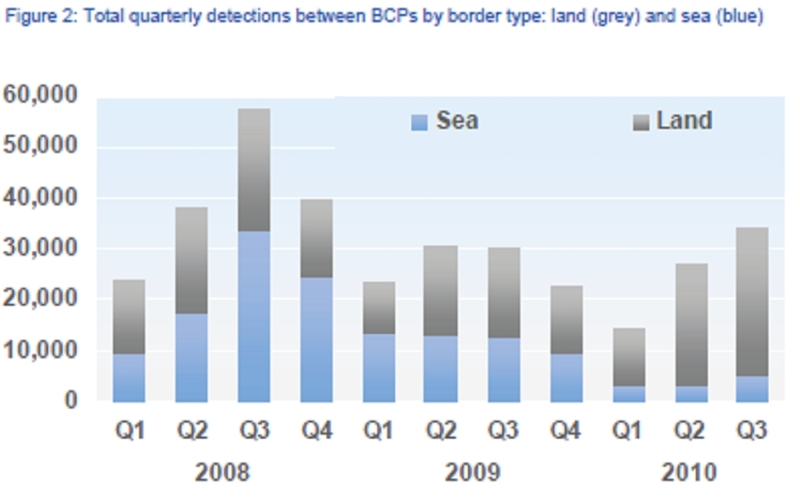 See Figure 4 below which shows that detections of illegal border crossers at the land border of Greece have exceeded detections at the sea border since Q1 of 2010. Click here for the 3rd Quarter 2010 Report. Click here for the 2nd Quarter 2010 Report. Click here for the 1st Quarter 2010 Report. Click here for my previous post regarding the 2nd Quarter Report. Note the further breakdown of the figures in the Legends of the two maps. You probably need to click on the links to view higher quality images of the maps. Click here for link to Jan-June 2010 Map. Click here for link to 2009 Map.